Not the very fastest throughput, but super range and a top package. We’re seeing a lot of more expensive Wireless AC routers come onto the market at the moment. With our homes now having so many devices, networking manufacturers see the upgrade market as the big growth area in addition to the increased bandwidth demand from multiple streams including inside the home from devices like Sky Q. The Exo range – with its stunning bright orange finish – is designed to cope with demanding bandwidth requirements. 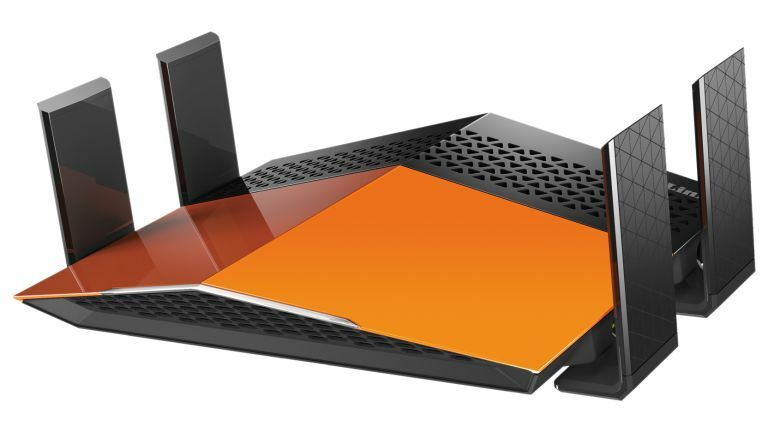 This router features the fastest AC1900 version of 802.11ac, which features one 5GHz network and one 2.4Ghz network (a cheaper and slightly slower version is available with AC1750 wireless). Unlike many routers that display two or even three separate networks, the D-Link only shows one – a technology called SmartConnect determines the best network (2.4 or 5 GHz) for your device without you having to faff around. This is very welcome. Throughput wasn’t as fast as some we’ve seen and in our same room test using 5GHz – passing data between two Macs via the router – we measured upwards of 300Mbps. But there’s a lot to love here, the super range especially, which stretched to the end of our 30ft garden. We also appreciated the physical switches on the rear to switch on and off as well as change the router into repeater mode (it makes for an expensive repeater, but useful if circumstances change). The only thing missing that most competitors have got is a USB port, but there aren’t many people sharing routers or storage devices via their router, so we’ll let that one pass.